We strip all shapes and colors of brick on our hands and knees. We do our stripping by hand so that we can offer the highest quality detailed work when removing existing varnishes, lacquers, acrylic, oil based sealers, paint over spray, and stain off of the brick. We first pressure wash the exterior of the brick, removing any loose dirt such as algae, mold, and sap. We acid clean it by hand getting the grout and corners really well. The acid will also remove calcium, and efflorescence often left behind by plants, yard furniture, and sprinkler over spray.. What happens is, the water puddles in low spots and under flower pots, saturating the brick. As it dries out, it begins to show efflorescence, calcium, and hard water. And let’s not forget good ole mother nature.This process is a perpetual cycle going on month after month, year after year. 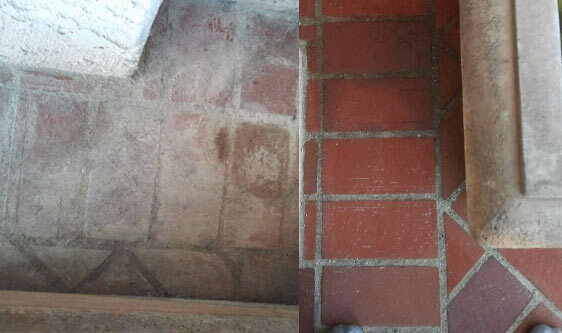 Over time, if the bricks are not cleaned and Sealed properly, they just get worse and worse. The brick is then sealed for protection and you have four options of sealer. Types of bricks we work with are antique bricks, fire red bricks, recycled bricks & reclaimed bricks, mud bricks, concrete bricks, calcium-silicate bricks, dry pressed bricks, extruded bricks, mexitegal bricks, mexitegal Mexican bricks, fly ash bricks from India, sand-lime bricks, London stock brick, Cambridgeshire white bricks, Columbian bricks, and much more. There are bricks imported from all over the world daily into the U.S. that we can help you maintain and keep your bricks looking great for years to come. Contact California tile restoration today.